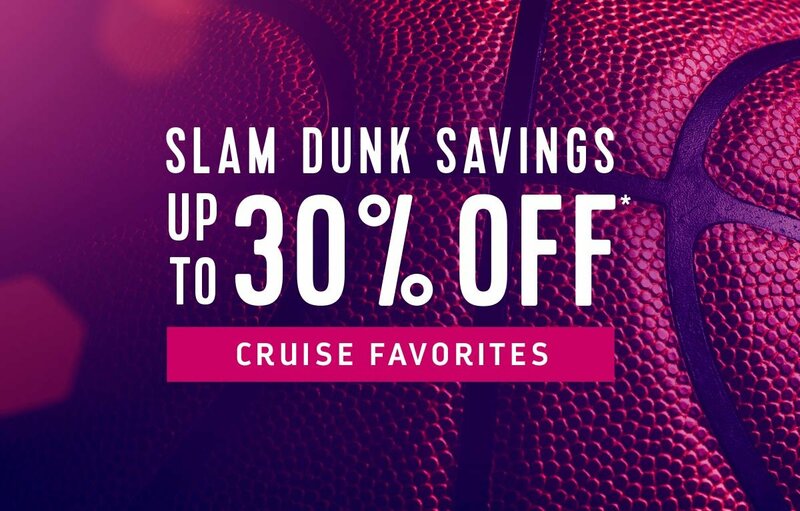 Royal Caribbean is offering up to 30% off pre-cruise purchases with the Slam Dunk Savings sale. The Cruise Planner sale runs between April 4 and April 11, 2019 and is valid on sailings from April 13, 2019 – October 31, 2019. Deluxe Beverage Package + VOOM Surf & Stream 1 Device: Discount varies by ship. (Excludes Charter Sailings). Deluxe Beverage Package. Discount Varies by Ship. (Excludes Charter Sailings). Refreshment Package: 30% off onboard prices. (Excludes Charter Sailings). Save up to 25% on select tours on select sailings. Discount varies by ship. (Excludes Charter Sailings). VOOM Surf + Stream Voyage Package 1, 2, 3, 4 Device(s): Discount varies by ship. (Excludes Charter Sailings). VOOM Surf Voyage Package 1, 2, 3, 4, Device(s): Discount varies by ship. (Excludes Charter Sailings). 3 Night Dining Package. Discount varies by ship. (Excludes MA, MJ, OA Interporting + Master Sailings and Charter Sailings). Ultimate Dining Package on 3 Night,4 Night and 5 Night. Discount varies by ship. (Excludes AD, AL, EX, FR, HM, LB, MJ, OA, OV, QN, RH, SC, SY + Charter Sailings). All Access Ship Tour. 10% off. Discount varies by ship. (Excludes Charter Sailings).